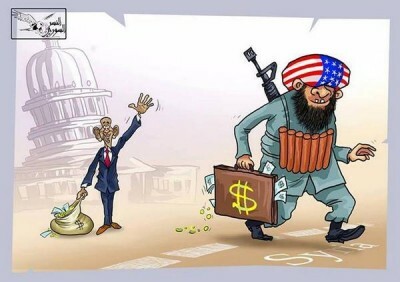 ISIS/Daesh have always been place-setters for the U.S Empire and its Coalition of regime-change criminal cohorts. Once Daesh is installed in an area, the area is destroyed and depopulated. Syrians flee from terrorist-held areas, to government -secured areas. Now that the Syrian government and its allies are winning the just war against Western backed, sustained, and integrated terrorists, the West’s strategic use of its terror proxies is becoming more apparent. Video satellite imagery reveals, for example, Western military installations ensconced in Daesh territory. This is normal, because the West and Daesh are comrades-in-arms. The fact that the “Kurdish” SDF are transparently aligned with ISIS in Deir ez Zor should be of no surprise either, since the SDF are also aligned with the West and its allies, including of course Israel. Sometimes the terrorists fight each other, but those who pay the salaries and enable the chaos and destruction of Syria are the overlords. The dirty war exists because of the West and its allies and their regime-change partners. There is nothing humanitarian about it, and it is not a counter-terrorism operation. It is a pro-terrorism regime change/dirty war. Syrian refugees, including Christians and minority groups, are flooding back into Syria precisely because the Syrian government is winning. The Syrian government is secular and tolerant. Christians, as an example are not flooding back to Iraq, because the imperial West destroyed that country and the Constitution is no longer secular. Western populations should shed their illusions. Our governments are committing war crimes and imposing an overseas holocaust on non-belligerent countries. The West and its allies are terrorizing and destroying countries and they are falsely projecting their own high crimes onto their victims. 1 Mark Taliano, “The Islamic State as ‘Place-Setter’ for the American Empire. ISIS is the Product of the US Military-Intelligence Complex.” Global Research, 30 August, 2017. (https://www.globalresearch.ca/the-islamic-state-as-place-setter-for-u-s-empire-isis-is-the-product-of-the-us-military-intelligence-complex/5606371) Accessed 28 September, 2017. 2 Felicity Arbuthnot, Facebook commentary, 27 September, 2017. 3 Yousef Issa, Facebook comment, 27 September, 2017.